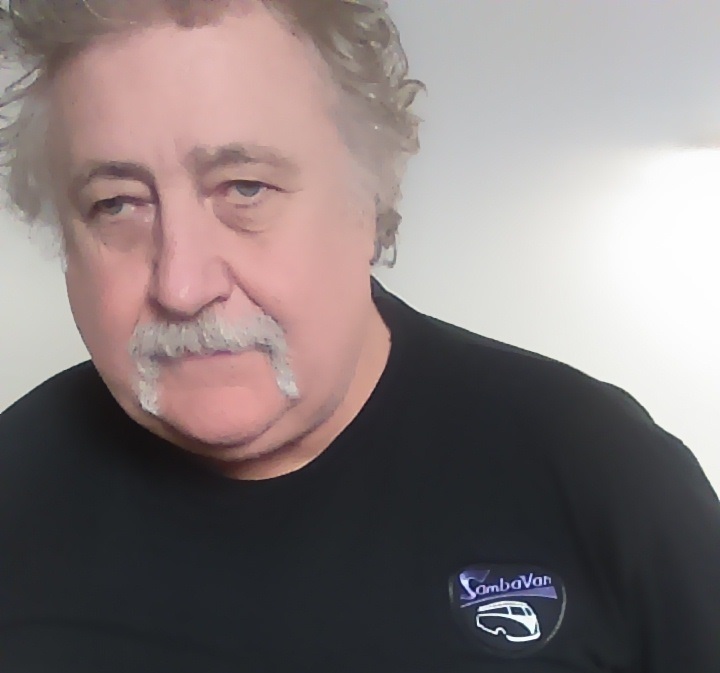 I'm Kevin Mason, a mechanical engineer with many years of experience in a number of disciplines. During my travels, I've come across many converted VW Transporters/Buses: Bars, Burger Vans, Barbeques........... The list goes on. But....they're becoming increasingly rarer and more expensive. I couldn't quite bring myself to cutting one up, to be honest. The commercial possibilities in producing an affordable mobile business platform based on such an iconic design were appealing. 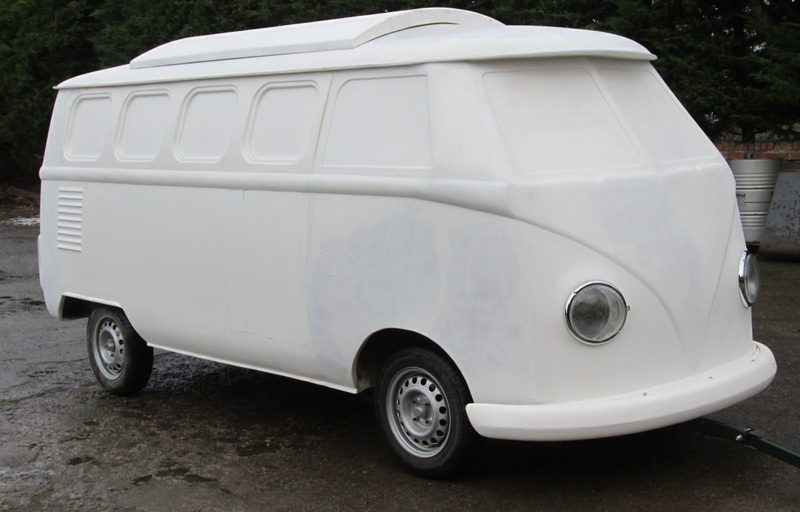 A glass fibre body mounted on a steel trailer chassis was the obvious route to take, and I'd had plenty of experience in both glassfibre and steel fabrication. The trailer part of the package was easy, and my preferred option was to design a frame with a wheel on each corner; the front axle would be steered. The first body was made from scratch – all I had as a starting point were a partial front panel, two rear ¾ panels, and an engine lid. Everything else was fashioned from fibreglass sheets, Contiplas, wood and plastic piping. The first prototype was a standard roof version with hinged pop-top. Just over a year ago, I tested reaction to it in a couple of VW-related Facebook Groups. The post received 1200 hits in 24 hours and gave me enough confidence to commit more time and money to the project. A couple of questions raised in these groups needed addressing. Some thought that reversing a steered trailer would be more difficult. It is much easier to manufacture a conventional 'central fixed axle' trailer and it was a simple decision to offer this as an alternative platform. People already operating converted pop-top bars have said they can be annoying in the wind. I was already an admirer of the original van's Hi-Roof variant and decided that this would be an attractive option on several levels – more space, more headroom throughout, the possibility of permanent high level fixtures and fittings and a better working environment in adverse weather. That was my next 10 months leisure time gone! There was one other thing I'd been mulling over for a while and this related to the first point: trailers over 750Kg in the UK needed braking – on ALL wheels, and with auto reversing hubs! For all practical (and financial) purposes, this ruled out a steered axle for a heavy setup. 2 chassis options – a 4-wheel steered unit for sub-750Kg trailers and a conventional centre-axle choice suitable for both light trailers and 750Kg+ units. Sketches show the latter would not detract too much aesthetically. 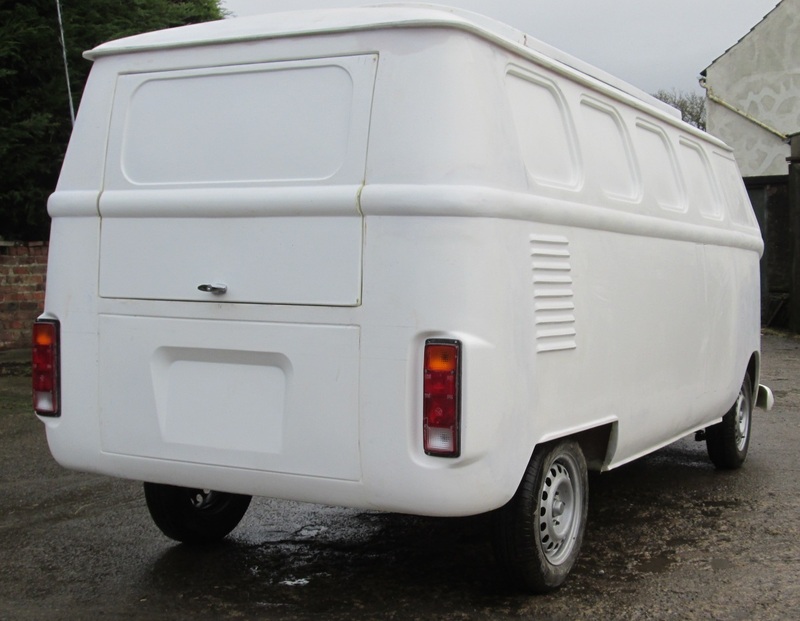 2 body options – standard roof with hinged pop-top opening, and Hi-Roof. The central axle ruled out side doors, and I've settled on a rear opening door for both variants. 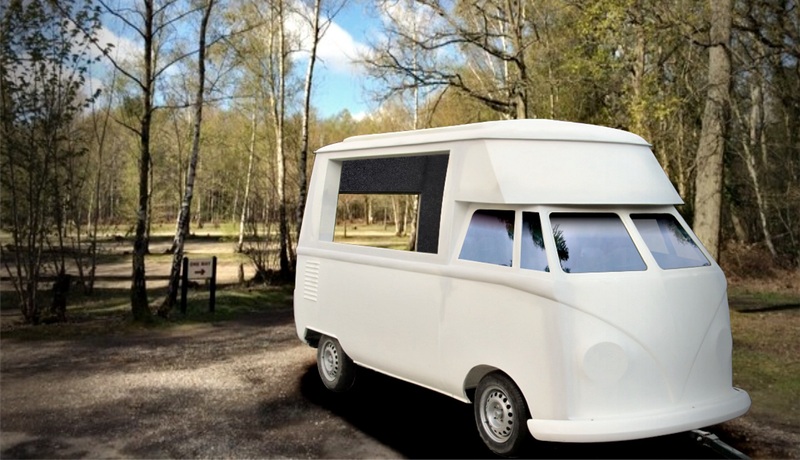 The current status of the project is that I've produced two prototype bodies; standard roof and Hi-Roof. I have pre-production moulds for these. Most importantly, I now have the confidence to commit more time and money. To speed up the transition from prototype stage to production, I'm seeking funding for more development work, finished production moulds, and machinery. Oh – and it would be really nice to trade in the open barn on my friend's farm (complete with dirt floor) for an industrial unit.  If anyone has some decent, cheap available workspace in the UK, preferably in the NE of England, I'd be interested in hearing from you. For the last few years, I've been printing performance T-shirts in my spare time, using the sublimation process, and these will form the basis for some of my rewards. They are lightweight, breathable mesh shirts, and fantastically comfortable to wear. 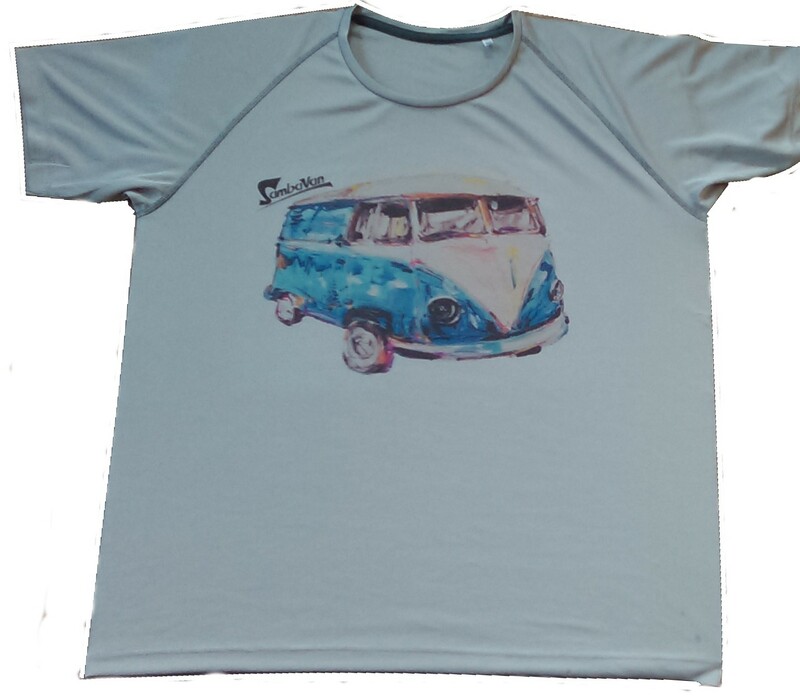 I can only print onto the white and silver/grey shirts shown. Like all serious sports shirts, they wick perspiration away in hot conditions and dry out very quickly. I can't get sizes above a 46” chest however (although they stretch to over 50"), but can offer a good quality 100% cotton T, complete with Sambavan embroidered badge pressed onto it, for those requiring larger sizes or a cotton T. I will try and accommodate people who want a different colour cotton shirt but black is the only colour badge available. The same badge/patch is also on offer for those wishing to pledge £10. A pledge of £125 will get you discount on a body/trailer, in addition to other items . Sambavan – Like a caravan, only different. 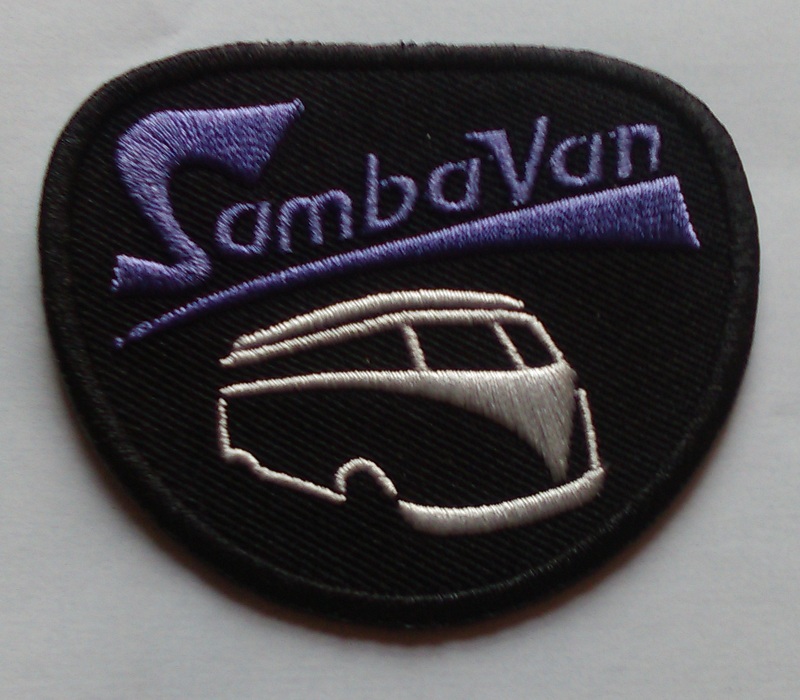 A quality embroidered badge/patch with the Sambavan logo. Can be heat pressed and/or stitched onto an item of clothing, rucksack, etc. 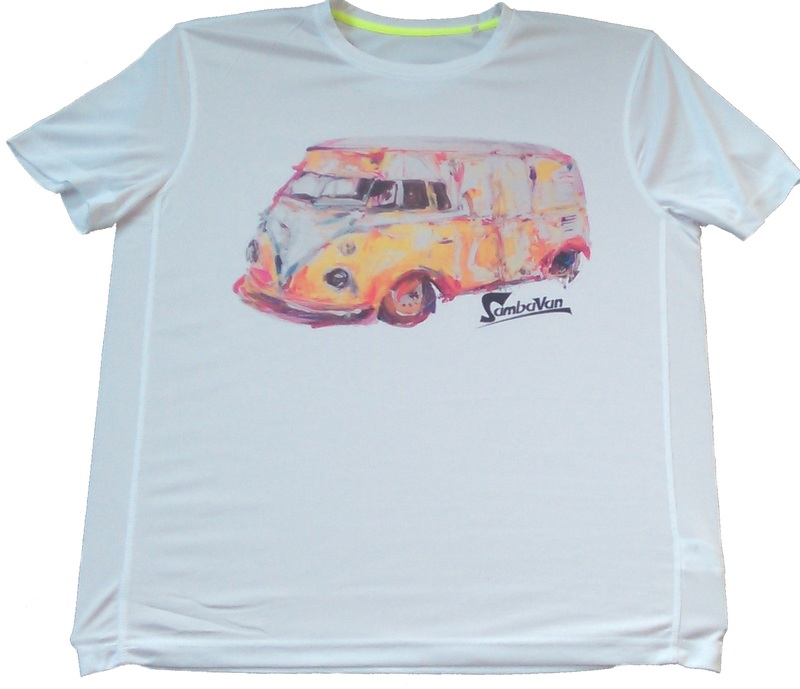 Performance T- shirt in white or silver/grey , or 100% cotton T with embroidered badge pressed onto it. 2 T-shirts as described above. 2 T-shirts plus £500 discount on a body/trailer kit with cab glass and rear glass. Multiple discounts cannot be applied to one kit.Completion dates on kits is dependent on take up of offer and lead times.